Balance in scoring points in as many events and disciplines as possible has been a goal of Carey High School girls’ track and field coach Lane Kirkland since he took over at the Panther girls’ helm from his father Heber Kirkland back in 2002. Saturday, team balance clinched the 4th District 1A track and field championship for Carey when the 14-school state-qualifying meet wrapped up at Jerome High School. It was the first district title for Panther coach Lane Kirkland. The Carey girls piled up 36 points in the distance runs and 32 in the relays to go along with 20 in the field, 14.5 in sprints and 8 hurdles for a team total of 110.5 points. Next best in an extremely tight race for district honors was Hagerman with 106.5 points ahead of Raft River of Malta 103 and Camas County of Fairfield 102. Carey had never entered a female pole vaulter before in competition, but coach Kirkland enlisted his junior-class daughter Daphne Kirkland to compete in that event this spring. Daphne’s eight points for second place in pole vault was important. So was the entire team effort. Coach Kirkland said, “Everything counted, and everybody did so well. It was a great team effort. We scored points in a lot of events and everybody stayed the course, improving all through the season. Raft River, a six-time 1A state girls’ champion, had edged Carey 103-99.5 at district back in 2003 and had relegated Carey to second place 132-118 in 2007. Last spring, Carey’s girls finished fourth 26 points behind first-time district girls’ champion Camas County. At Jerome Saturday, Raft River’s girls ended up with five gold medals compared to four apiece for Carey and Camas County. Carey’s distance points turned out to be decisive, as its 36 points in distances out-gained Raft River (0), Hagerman (10) and Camas (10). Leading Carey was senior Jaide Parke, who swept the three distance runs for 30 points. She won the 800-meter run by seven seconds, the 1600m by 28.11 seconds and the 3200m by nearly two minutes. 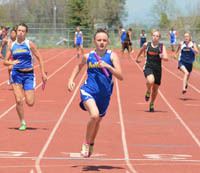 Adding a fourth Panther gold was the 4x100m relay with Daphne Kirkland, McKayla Mecham, Arriana Nielson and Kelsey Barker. Camas County senior Stephanie Moore piled up 34 individual points with gold medals in long jump and triple jump, second in high hurdles and third in 200m dash. Musher junior Taylor Gorringe captured the shotput and discus. Also, Community School sophomore Sydney Hagenbuch won the 400m dash in a photo finish with a 1:01.85 time. In all, nine Carey girls in nine events qualified for the State 1A track and field meet Friday and Saturday at Middleton High School. Camas qualified five girls in eight events led by Moore, who will compete in four events at Middleton. Winning the district boys’ competition Saturday were the Hagerman Pirates 129-104 over Raft River. The Camas County and Dietrich boys tied for fourth place with 58 points. Capturing gold medals for the boys were Camas County senior Jordan Robles in discus and sophomore Issac Simon in high jump. Five Musher boys qualified for state. So did one Carey boy, junior Luis Garcia in the long jump. Other outstanding girls at district: Raft River junior Kami Freestone winning both hurdles events and anchoring the winning Trojan 4x200m and medley relay teams for 25 individual points; and North Valley Academy junior Samantha Lofgran taking the 100m dash in 13.50 seconds. Castleford seniors Ty Zimmers (100m and 200m winner) and Logan Rector (both hurdles by wide margins), plus Lighthouse Christian Academy senior Eli Berndt (36 points including long jump and triple jump wins by 7.5 and 5.5 inches) and Murtaugh senior Troy Baynes (800m and 3200m winner). Hagerman junior Kade Kress led the Pirates to the team title with a shotput gold medal plus important contributions to the winning 4x100m and 4x200m relay teams. Dietrich’s Blue Devils also had a good meet at Jerome, winning the medley relay by nearly four seconds and grabbing second places in the 4x400m. Dietrich will carry the third-best qualifying marks in those relays to state. Also, Dietrich junior Jacob Dalton won at 1600m by 11 seconds. Teams: 1—Carey 110.5 points (14.5 sprints, 36 distances, 8 hurdles, 32 relays, 20 field). 2—Hagerman 106.5 (25 sprints, 10 distances, 5 hurdles, 26 relays, 40.5 field). 3—Raft River of Malta 103 points (14 sprints, 0 distances, 33 hurdles, 38 relays, 18 field). 4—Camas County of Fairfield 102 (6 sprints, 10 distances, 9 hurdles, 10 relays, 67 field. 5—Hansen 44.5. 6—Lighthouse Christian Academy 31. 7—North Valley Academy of Gooding 24. 8—Murtaugh 21. 9—Shoshone 19. 10—Dietrich 18. 11—Glenns Ferry 15. 12—Richfield 13. 13—Community School of Sun Valley 10. 14—Castleford 8. 100m: 2—Kelsey Barker (C) 13.78. 6 (tie)—Clarissa Kirkland (C) 14.03. 200m: 3—Stephanie Moore (CC) 28.70. 5—McKayla Mecham (C) 28.76. 400m: 1—Sydney Hagenbuch (CS) 1:01.85. 800m: 1—Jaide Parke (C) 2:34.80. 3—Lilly Rivera (C) 2:43.12. 5—Kylie Walker (CC) 2:47.37. 1600m: 1—Jaide Parke (C) 5:43.99. 4—Brittani Hulme (CC) 6:20.05. 3200m: 1—Jaide Parke (C) 12:25.6. 8—Adriane McGuire (CC) 15:57.60. 100m high hurdles: 2—Stephanie Moore (CC) 17.95. 7—Emily Wittemann (C) 21.23. 300m intermediate hurdles: 3—Medin Cenarrusa (C) 51.79. 8—Brittani Hulme (CC) 55.47. 4x100m relay: 1—Carey (Daphne Kirkland, McKayla Mecham, Arriana Nielson, Kelsey Barker) 53.65. 4—Camas County (Etta Seaman, Tana Sabin, Felicity Willis, Isabelle Ornelas) 57.13. 4x200m relay: 2—Carey (Lilly Rivera, Kelsey Barker, Medin Cenarrusa, McKayla Mecham) 1:53.67. 4—Camas County (Etta Seaman, Tana Sabin, Isabelle Ornelas, Felicity Willis) 2:00.94. 4x400m relay: 3—Carey (Hailee Johnson, Lilly Rivera, McKayla Mecham, Medin Cenarrusa) 4:33.32. Sprint medley relay (100, 100, 200, 400): 2—Carey (Daphne Kirkland, Clarissa Kirkland, Kelsey Barker, Medin Cenarrusa) 2:00.91. Shotput: 1—Taylor Gorringe (CC) 37-8.25. 8—Sierra Sabin (CC) 28-11. Discus: 1—Taylor Gorringe (CC) 103-10. 6—Jessica Lanier (CC) 90-2. High jump: 4—Brittany Hulme (CC) 4-6.5—Hunter Rasmussen (CC) 4-6, 8—Shayla Adamson (C) 4-2. Long jump: 1—Stephanie Moore (CC) 16-6. 3—Hailee Johnson (C) 14-9. 6—Clarissa Kirkland (C) 13-8. Triple jump: 1—Stephanie Moore (CC) 32-2.75. 2—Hunter Rasmussen (CC) 30-8.75. 3—Kylie Walker (CC) 29-9.5. 7—Clarissa Kirkland (C) 28-2.25. Teams: 1—Hagerman 129 (20 sprints, 38 distances, 0 hurdles, 34 relays, 37 field). 2—Raft River 104 (27 sprints, 13 distances, 2 hurdles, 32 relays, 30 field). 3—Castleford 65. 4—Camas County 58 (5 sprints, 9 distances, 0 hurdles, 8 relays, 36 field) and Dietrich 58. 6—Shoshone 54. 7—Lighthouse Christian Academy 48. 8—Murtaugh 42.5. 9—Hansen 39. 10—Carey 37.5 (3 sprints, 1 distances, 2 hurdles, 16.5 relays, 15 field). 11—North Valley Academy 26. 12—Richfield 18. 100m: 6—Christian Zarate (C) 12.15. 400m: 4—Davey Knowlton (CC) 54.48. 1600m: 6—Jerry Gonzalez (CC) 5:20.94. 8—Collin Whitby (C) 5:25.76. 3200m: 3—Jerry Gonzalez (CC) 11:32.10. 110m high hurdles: 8—Nate Adamson (C) 20.47. 300m intermediate hurdles: 8—Nate Adamson (C) 47.76. 4x100m relay: 4—Carey (Tori Alvarez, Luis Garcia, Gunner Thompson, Christian Zarate) 48.13. 4x200m relay: 3—Carey (Tori Alvarez, Luis Garcia, Gunner Thompson, Christian Zarate) 1:38.65. 5—Camas County (Colton Rasmussen, Jordan Robles, Ebie Myles, Davey Knowlton) 1:40.61. 4x400m relay: 5—Camas County (Colton Rasmussen, Jordan Moore, Issac Simon, Jerry Gonzalez) 4:03.80. 6 (tie)—Carey 4:08.80. Sprint medley relay: 6—Carey (Nate Adamson, Tori Alvarez, Jordan Dilworth, Zach Olsen) 4:10.88. Shotput: 5—Francisco Gamino (C) 44-6. 7—Jordan Robles (CC) 43-2.25. Discus: 1—Jordan Robles (CC) 147-11. High jump: 1—Issac Simon (CC) 6-0. 5—Bryson Van Every (C) 5-4. Long jump: 3—Luis Garcia (C) 19-7.5. 6—Jordan Moore (CC) 18-8.75. 7—Davey Knowlton (CC) 18-5.75. Triple jump: 3—Colton Rasmussen (CC) 40-10.5. 6—Issac Simon (CC) 39-4. 8—Luis Garcia (C) 38-1.